Ultra-endurance athlete Jason P. Lester is used to tackling big challenges. He just completed a 2,600-mile run across the Great Wall of China in 83 days. Now that he’s back home in Kailua-Kona, Hawaii, Lester set up a challenge for himself and the local community: help provide a Christmas gift for every keiki in need in West Hawaii. Lester, the first disabled athlete to compete in the Ultraman World Championships, led the “CHA11ENGE ENDURANCE RUN,” a nonstop run for 72-plus hours. For every mile Lester and other athletes ran, community members donated toy for The Salvation Army’s Kailua-Kona Corps Angel Tree at the local Walmart or make a donation in the event’s Red Kettle. Kailua-Kona corps officers Lts. Jessica and Michael Stack with ultra-endurance athlete Jason P. Lester. 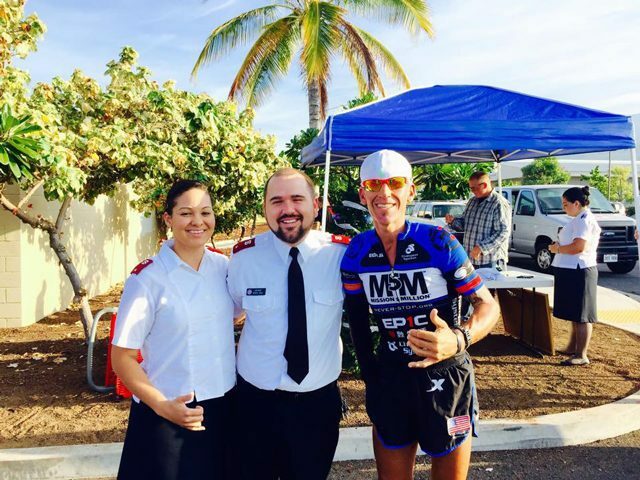 Major John Chamness, Salvation Army Hawaiian and Pacific Islands divisional commander, and Lt. Mike Stack, Kailua-Kona corps officer, both joined Lester for different portions of the race. Event supporters include The Never Stop Foundation, EP1C Endurance Performance, Akamai Pest Solutions, VEGA, Vitamin Shoppe and XTEP.